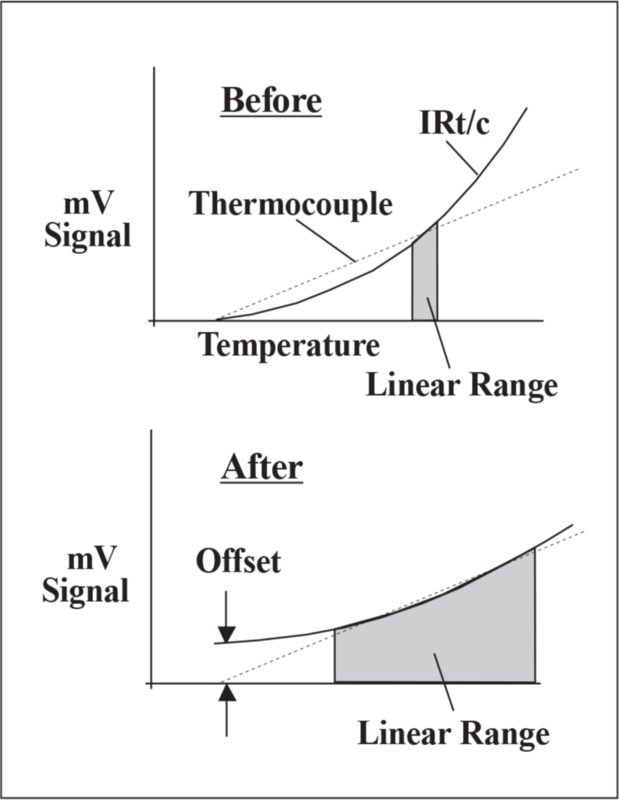 All IRt/c models with the “A” designator (example: IRt/c.10A-K-Lo E) are equipped with a calibration adjustment feature that makes it possible to precisely calibrate the IRt/c to the temperature control requirements. However, for installations in which monitoring of temperature rather than control is desired, a wide linear range is convenient. Accordingly, the procedure described below can be used to produce a very wide linear range when using controllers, meters, PLCs, transmitters, etc. for temperature monitoring. The only requirement is that an OFFSET, ZERO, LO CAL, or equivalent adjustment be available to offset the reading. 1. Set the readout device to the offset value shown in Table I. 2. Adjust the calibration screw on the IRt/c to the correct target temperature. Example: Apply a Lo E model to monitor steel at 1800°F (980°C). 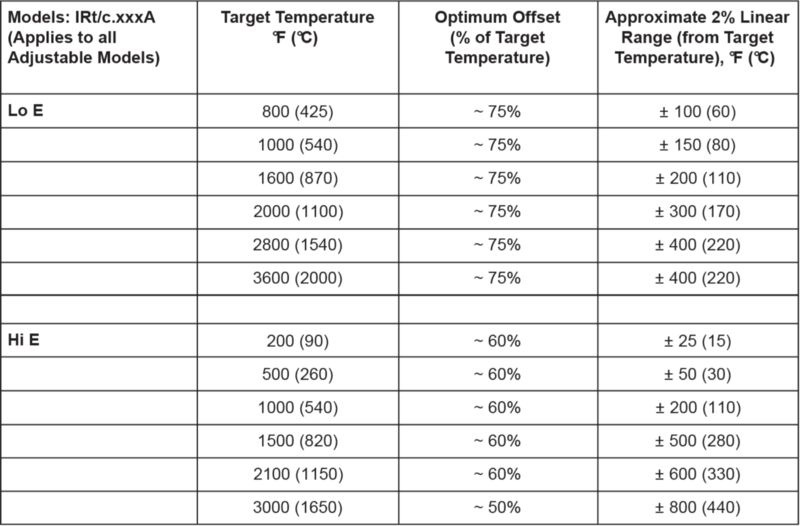 Cover the IRt/c with aluminum foil such that it cannot see the target, then set the readout device offset so that the display reads approximately 75% of target temperature: .75 x 1800 = 1350°F (.75 x 980 = 735°C). Remove foil, point IRt/c at intended target, and adjust the calibration screw on the back of the IRt/c until the readout display reads the correct temperature, or within a few percent of the correct temperature. Fine tune the reading at the readout device as required. The calibration is complete, and the linear range over which the reading will be within 2% of actual is approximately 1800°F ±250°F (980°C ±140°C).